"Globally, one in every 122 humans is now either a refugee, internally displaced, or seeking asylum. If this were the population of a country, it would be the world's 24th biggest." This shocking statistic is just one thing I learned in the process of researching the state of our global refugees. Here are nine facts you probably didn't know about global refugees - number 9 has some tips for how you and I can help. 1. By the end of 2014, nearly 60 million people were displaced from their homes. That's the highest number of refugees and internally displaced people (IDPs) ever recorded in human history. The last time the world hit over 50 million refugees was the mid-20th century in the wake of World War II. 2. Internally displaced people (IDPs) rose by more than 300% between 2004 and 2013. When we say "refugee", we mean people who have fled their country of origin to seek safe haven in a foreign country. But a rising number of those forced from their homes are internally displaced, meaning they are still in their country of citizenship but have been effectively made homeless by a local crisis. One current example are all the Iraqis fleeing terrorism and ending up in camps or cities in Kurdistan, the most stable region of Iraq. 3. The world's poorest countries host the majority of the world's refugees. 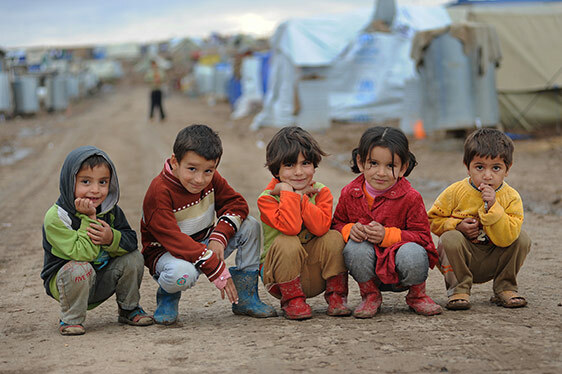 According to the UN High Commissioner for Refugees, António Guterres, "The economic, social and human cost of caring for refugees and the internally displaced is being borne mostly by poor communities, those who are least able to afford it.” The UNHCR Global Trends 2013 report revealed that developing countries hosted 86 percent of the world's refugees. Rwanda, Tanzania, and Democratic Republic of the Congo are currently taking in a new influx of Burundi refugees. 4. The global refugee crisis is getting very expensive. It's almost unbelievable but, according to the Internal Displacement Monitoring Centre, the annual cost of human displacement has now reached almost $100 billion. 5. War isn't the only condition that makes refugees. While armed conflict is responsible for many of the displaced people in the world today, religious persecution, natural disasters, and the increasingly dramatic affects of climate change (drought, extreme temperatures, floods, etc.) also cause people to flee their homes. UNHCR reported 36 million people displaced by natural disasters in 2009. Sadly, environmental refugees are not protected by international laws. 6. A significant percentage of refugees are unaccompanied children. In the span of just eight months (Oct 2013 - May 2014) more than 47,000 unaccompanied minors were taken into custody at the US / Mexico border. Over 30% of the total refugees arriving in Rwanda from Burundi are children with no adult guardians. These two small samples are indicative of the child refugee situation - children have lost their parents to war, sickness, natural disaster and they now face the world alone with no home to return to. 7. Refugees don't just live in tent camps. We all have the stereotype of refugees crowded into the iconic UN blue and white tent villages in the middle of abandoned fields. However, increasing numbers of displaced people are choosing the urban life over the tents. They compete for local jobs, food, and housing, but often end up living in abject poverty or falling prey to abusive situations. 8. The problem isn't just in Iraq and Syria. While Syria is the single greatest contributor of refugees (21%) and IDPs (28%) to the world, the crisis isn't contained to just the Middle East. Columbia, Ukraine, Myanmar, Sudan, and many other countries are seeing a rise in displaced people, putting pressure on Europe, Africa, Asia, and the Americas. 9. Yes, there is something we can do to help! + Support refugee rights and resettlement in your home country. Sometimes, there's no option for a refugee to go back home. In that case, it's important for other nations to make room for them. When voting time rolls around, look into political parties' refugee policies and their immigration plans. + Contribute to environmental stability. Conserve water, bike to work, recycle - do whatever you can do to reduce climate change. Conflict over dwindling natural resources, rising natural disasters, and hunger due to climate change all contribute to the refugee crisis. To help the vulnerable in Ethiopia, FH is hard at work equipping farmers reclaim land and rehabilitate soil and water resources. + Support organizations, locally and globally, who care for refugees. For example, right now, FH Canada is supporting Burundi Refugees through the FH Rwanda office. + Fight poverty. Poverty often leads to local conflict, governmental corruption, rogue armies, and vulnerable communities. By combating poverty, we can help create a more peaceful world and stop a refugee situation before it ever begins.